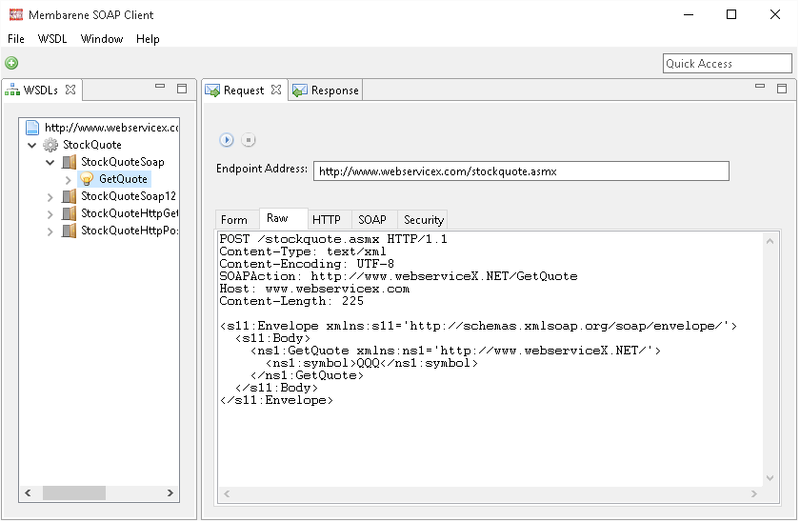 Is it possible to test a WSDL or SOAP service with PRTG? I would like to check the availability and response time of a WSDL or SOAP service. How can I do this with PRTG? You can test the availability and response time of a WSDL or SOAP service by utilizing an HTTP Advanced sensor. After all, a SOAP request is at its core just an HTTP POST transaction with a few special options set. 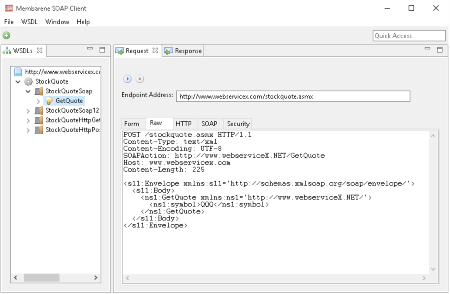 If you have the WSDL, you can generate the SOAP envelope using a standard tool, for example the Membrane SOAP Client or the Eclipse SoapUI Plugin. 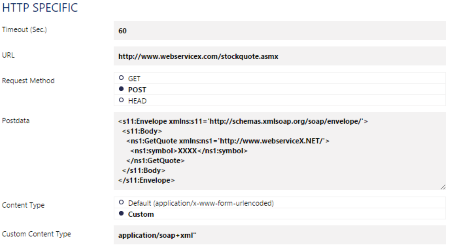 As an example, we will use a publicly available SOAP request that you can find in this Directory of Public SOAP Web Services: the StockQuoteWSDL. It defines the available operations and layout of the SOAP request. Add the HTTP Advanced sensor to a device in your device tree. Postdata: Paste in your SOAP Envelope. Custom HTTP Headers: Paste in your SOAP action and the SOAP content type: SOAP Action: [Your SOAP Action] Accept: [Your SOAP Content Type]. Result Handling: Store the latest HTML result. 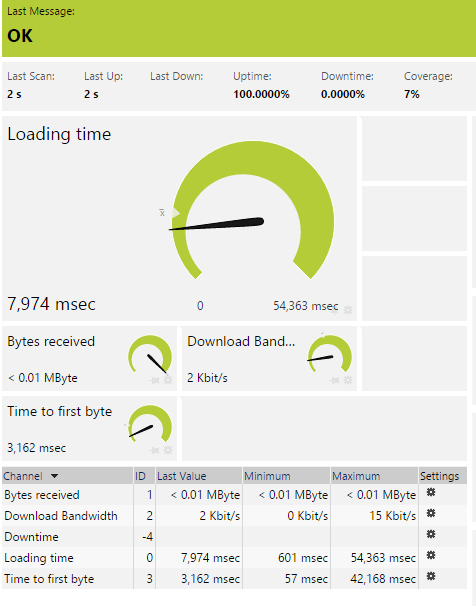 This option allows you to see the actual content of the server's response for debug/troubleshooting. Enlarge here. Result of Sensor xxxx: See the whole HTTP transaction. Result of Sensor xxxx-A: See the response or answer, which is the raw SOAP return envelope. If you want to check the content with a keyword to trigger a warning or error status, you have to use a literal match. 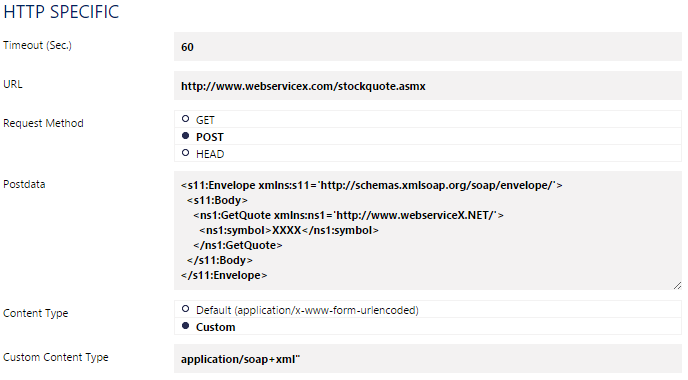 In this example, we’re looking for the last price for the stock: <Last> which is XML Escaped as &lt;Last&gt;. Require Keyword: Set sensor to warning if keyword is missing. Response Must Include: [Your Keyword], here: &lt;Last&gt;. The HTTP Advanced sensor will also give you all the timing information for the SOAP service.